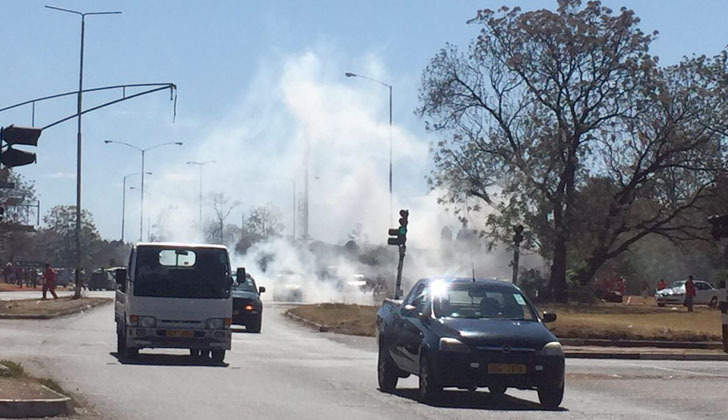 The government has announced that over 200 people who participated in yesterday's violent protests have been arrested as police are analyzing photos and videos to effect investigations and arrests. In a statement on Tuesday the Ministry of Information said, "Over 200 individuals suspected of being involved in yesterday's violent criminality have been arrested. The security services tracking down others and sifting through video and photographic evidence to identify more. Normalcy is assured and the public is urged to do their normal activities." The Ministry also said the police are keen on interviewing a civilian who was seen brandishing an automatic rifle and firing it. "The police are seeking assistance from the public to identify the suspected terrorist in this picture. Who is he? Where did he obtain the assault weapon he is brazenly brandishing from? He is suspected of shooting some innocent civilians." The police also issued a statement passing their condolences to victims of the protests and saying they are keen on interviewing protestors captured on camera looting and engaging in acts of violence. "Yesterday Zimbabwe experienced acts of terrorism. We send our condolences to those that fell victim to the terrorists and lost loved ones. Govt would like to assure the public that these will face justice." Police said. "The police has noted with concern that the on going protests have turned violent. While individuals have a right to demonstrate the right should be exercised in peace. Acts of violence violate other people's rights and are not acceptable."